It is common nowadays to hear self-proclaimed pundits extolling the benefits of a strong currency, one that is tied to gold, commonly known as the gold standard, just so to prevent the erosion of its value by irresponsible politicians. Most people will be swayed by the seductiveness of this assertion without realising the misfortune that it will wreak on the many in order to benefit the few. Still, can we resurrect the gold standard? It's easy to decide if you're Joe Public. The thought that your savings won't be stealthily diminished by the government's money printing shenanigans is good enough reason to revert to the gold standard. But how sure are you that you're going to have savings in the first place? That's the issue that should've been addressed. Those pundits manage funds in the billions of dollars and their advice surely has a self serving agenda. Instead the best counsel to understanding the appropriateness of a monetary or currency system is of course economic history especially the evolution of our modern-day currencies over the last 100 years. The theoretical underpinning that superbly explains the currency evolution is none other than the Mundell-Fleming trilemma (see diagram from The Telegraph below). This economic model was formulated independently by economists Robert Mundell and Marcus Fleming. 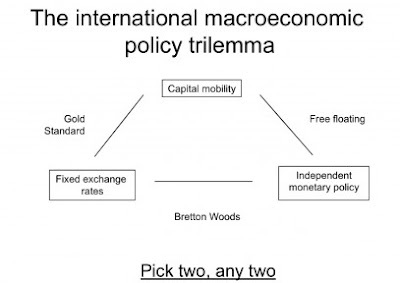 Under this monetary policy trilemma, you can only pick two out of three choices. Actually, the word 'can' is misleading as you'll soon realise that you can't decide; the choices have been predetermined. If you choose all three, the trilemma will penalise you for this transgression and put you in a worse off position than before. A political leader's role thus is to move with the ebb and flow of economic waves. This trilemma won't be explained here in detail since you can google its many articles on the web. Instead this post will demonstrate that the trilemma doesn't justify its name because picking up which two of the three options is a no-brainer. The three choices available in the trilemma are fixed exchange rates, capital mobility and independent monetary policy. In chronological order, our modern-day currencies, that is, over the last 100 years, began with the gold standard which lasted until 1914, the start of World War I when it was suspended. In any crisis or panic such as war, everybody wants to switch to gold which can lead to a severe run on a country's gold reserves. To preempt that, you have to suspend gold convertibility. During the heyday of the pre-1914 gold standard, capital was mobile and exchange rates were fixed but no country had control over its monetary policy, i.e., it could not set its interest rates nor money supply. But the world then had minimal borrowings. Government deficits were unknown except in times of war; in the first half of 1910s the US government debt was less than 4.0 percent of its GDP. Governments derived their incomes from import tariffs. The US government only reestablished its income tax in 1913 after the earlier one, necessitated by the Civil War, had been abolished in 1872. Consumer credit was small and only used for the purchase of furniture and sewing machines; credit for consumer durables was introduced only after World War I. In those days, the population was largely rural, so money was not crucial for the low-volume economic transactions which in most cases were carried out through barter. The farmers upon harvesting would deliver enough supply of flour, after it had been ground by the miller, to the grocer in exchange for one year's supply of groceries. Sometimes, it entailed a system of credit to be settled upon harvesting. In rural areas such a system worked because everybody knew one another; running away from your obligation wasn't an option. In present-day cities where everyone is a stranger, barter is impracticable. Without money, life in cities would collapse. But in the beginning of the last century, there was little need for financial savings. You could rely on your next of kin and neighbours should any misfortune befall you. If all else failed, death was just around the corner. Life expectancy in the 1910s was in the early 50s, that is, you worked until you fell dead. So you didn't have to save for old age. The problem with the gold standard was that the money supply was restricted to the amount of gold held as reserves. With the annual global gold supply increasing at only 1.5 percent, there was always the risk that money supply would be outpaced by goods and services production, which was increasing at 2.6 percent annually from 1900 to 1925. A situation of falling prices or deflation would soon follow. Of course, policymakers could issue bank notes not supported by gold reserves but they'd be courting the serious danger of inadequate reserves should there be a run on gold. As long as credit was minimal, the gold standard could persist because the likelihood of a financial panic was small. Under the gold standard, the policymakers couldn't pump up the money supply to replace money withdrawn from the system unless they could come up with enough gold reserves. And money could only disappear if a substantial part of it was in the form of credit (if you've been following my earlier posts, by now, you should know how money vanishes). World War I upended this calm scenario. To finance the war, the countries resorted to deficit spending by printing money. The US on the other hand benefited from the overseas demand for war materials. From being the largest debtor in 1914, it transformed into the largest creditor in 1918. Its capital surplus was then invested in Europe. The Europeans however were suffering from high inflation as a result of money printing to finance their deficits; Germany especially suffered terribly from hyperinflation from 1921 to 1923. To dampen the inflation, Germany revived the gold standard in 1924 followed by Britain the next year. Because of the high value originally set for the pound, Britain suffered an economic contraction that by 1931 it had to dump the gold standard following which it enjoyed a five-year mini boom. Japan which had gone on gold standard in 1930 went off it within one year. Only the US and France were happily sequestering gold reserves because they had set their currencies at values lower than their real worth. Germany's stable currency had attracted funds from the US but the US stock market boom in 1928-1929 reversed the flow. Germany found itself short of money made worse by its uncompetitive economy because of the high value originally fixed for the German mark. Soon after getting out of hyperinflation, Germany was facing hyperdeflation. The resulting banking crisis and depression forced it to junk the gold standard in 1932 but it was too late to prevent Hitler from becoming chancellor in 1933. As they say, the rest is history. In fact, if you go back to the root cause, it could be argued that it was the US who sowed the seeds of World War II. By moving huge amount of funds in and out of Germany, it destabilised Germany's economic and financial conditions, facilitating Hitler's rise. Actually there's a way to cope with the shrinking money under the gold standard. It's by reducing prices, including wages, across the board. However powerful unions prevented such a move. Even now, nobody would tolerate having his pay cut. The only available alternative thus was to drop the gold standard and devalue the currency. That was how the gold standard met its fate. Moreover you can never have fixed exchange rates if you allow unrestricted international trade while maintaining inflexible prices and wages since some countries will always try to benefit at the expense of the others. Free trade is never fair. After Word War II, the US economy was at its greatest relative to that of the world: its share of world economic output was about 30 percent in 1945. It also had strong trade surplus and held two thirds of the world gold stock. As a result the US dollar was chosen as the reserve currency under the 1944 Bretton Woods agreement, a new currency arrangement to replace the gold standard. The British pound was also selected as another reserve currency but this was more to placate the British than for any other economic reason since Britain was no longer the superpower that it once had been. Under Bretton Woods, the politicians adopted a system that swapped capital mobility for independent monetary policy in order to escape the misery under the gold standard. This boded well for politicians since they now controlled the money supply. Thus it appeared that they could regulate the economy though the reality has always been the other way round. Under Bretton Woods, the dollar was pegged to gold and the other currencies in turn anchored to the dollar. Although the dollar was no longer convertible to gold, sovereign nations could still exchange with the Federal Reserve their dollar holdings for gold bullion. It was a gold standard of sorts. The key flaw with this arrangement is that with the dollar being the anchor currency, it restricted the US from adjusting its currency whenever it suffered current account deficits whereas the others could do so. As expected, what actually unfolded was that uncompetitive countries would adjust their currencies downwards while competitive ones, like Japan and Germany, would prevent any upward revision or did so at less than what should have been their appropriate values. The US bore the brunt of Bretton Woods. As long as the US was enjoying current account surpluses, this arrangement would last. Beginning in the mid 1950s, Germany and Japan were having persistent balance of payments (BOP) surpluses financed by the US BOP deficits. Actually the US current account was in surplus for most of the 1950s and 1960s. Its capital account on the other hand was in deficit because of foreign direct investments (FDI) by the US multinationals in Europe. The net impact overall however was still deficit because the negative balance of the capital account outweighed the current account's positive balance. The growth of the US multinationals can be traced to this propitious period. The industrialised economies of the West benefited greatly from the US FDIs. As the dollar flowed into Europe, by the late 1950s the European countries were confident enough to relax their exchange controls, flouting a fundamental rule of the trilemma. This capital mobility was to eventually kill Bretton Woods. As for the Bretton Woods reserve currencies, the British pound, being the weaker of the two was the first to lose the status. It had to devalue by 14 percent in 1967 after suffering a string of large current account deficits. In those days, a billion pound was a huge sum. Like oil wealth, possession of a reserve currency was a curse. Because other countries were accumulating dollar and pound reserves, the US and Britain would eventually suffer current account deficits which could not be redressed except through a devaluation. The gradual decline of the US current account began in 1968 with higher government spending following President Lyndon Johnson's Great Society programmes and increasing involvement in the Vietnam war. However, Nixon drastically reduced the deficits in his first two years as President but by 1971 the Vietnam spending took its toll. By August 1971, the dollar convertibility to gold was halted after it could no longer be defended against sustained withdrawals by other nations. That signaled the end of Bretton Woods. The US and Europe attempted to resurrect Bretton Woods in December 1971 through the Smithsonian Agreement but it was stillborn as the price of gold kept moving upwards. The trilemma could not entertain fixed exchange rates with free movement of capital. In the same year the US suffered its first current account deficit, of $1.4 billion followed by $5.8 billion the next year. Meanwhile the oil embargo following the October 1973 Arab Israeli war pushed the oil price from $3 to $12. The Arab states began accumulating petrodollars which they parked with the US banks which in turn relent them to the Latin Americans and the US private sector. Once the banks realised how easy it was to make profits from other people's money, they never looked back, forgetting their fiduciary duty to prudently manage the nation's money supply. The chart above (from The Economist) shows that the growth of the US financial sector began around this time. The high inflation, beginning in 1973, was initially caused by these recycled petrodollars, not money printing by the government though later the government also fanned it through its increasing budget deficits. Had the US crimped the money supply by increasing the banks' reserve requirement, the inflation wouldn't have ensued although a severe contraction would have been the outcome. As a result of these actions, from 1973 to 1981, the US money supply was boosted on average 6.5 percent annually. In consequence, the other major currencies appreciated against the dollar and the US current account turned positive from 1973 to 1976. But the other nations soon learned the trick, which was to tag their currencies after the dollar. They lowered their currency values through money creation. The US current account surpluses switched to deficits from 1977 to 1980. However, this concerted money creation effort unleashed inflation on a global scale. To suppress inflation, President Carter appointed Paul Volcker as the Fed chairman in August 1979. His solution was simply to increase the federal funds rate to 20 percent by mid 1981. The dollar became a stable currency, better in fact than gold because aside from credibility, it now had liquidity. Rarely in economic history would a currency possess both qualities. President Reagan capitalised on the strength of the dollar to unleash deficit spending on a scale unheard of before. The resultant massive current account deficits transformed the US from a creditor to a debtor by the mid 1980s (see left chart from The Economist). This time around, inflation didn't rear its ugly head as the global capacity was ready to unleash the supply to match the demand let loose by the monetary flood. The trilemma seemed to have been vanquished. But not quite. Just as the Europeans had been the beneficiaries in the 1960s and the petro states and the Latin Americans in the 1970s, the 1980s belonged to the Japanese. Intoxicated with dollar reserves, the Japanese kept suppressing the yen exchange rate by creating massive amount of yen through increased bank loans. The money ended up inflating stock and real estate prices. The spectacular collapse of these prices at the end of 1989 marked the twilight of Japan. Soon the 1990s was the turn of the Asian tigers. Again the same Japanese scheme was hatched and the same ruinous fate met in 1997. The Chinese latched onto similar machinations in the 2000s but this time on a much grander scale. This time is different, they gloat. A new global power is staking its rightful claim. Indeed, it is. Highways, bridges, tunnels and railroads, all to nowhere; buildings and factories, all for no one. Going by the reckoning of the past, China's chapter should have closed by the late 2000s. Trying to delay destiny into the 2010s is certainly a heavy price to pay just to prove that the trilemma can be subdued.